Every December my mom’s side of our family gathers around my aunt’s piano to sing carols. When my cousins and I were young, the gathering was Christmas Eve; my mom, her sisters, and each of their families. Now these families are stretched thinner at the holidays, with several spouses’ worth of sharing to be done. So we do this, early in the month; we sing together. It’s one of my favorite days of the year and there’s only one little thing I wish we could do away with. Every year, without fail, at least one person has to declare somewhere in the course of the singing that they “can’t.” Can’t sing. I’m used to it, and I get it. I really do. There are so many things I wish I could do. And furthermore, I’m not an accomplished singer. Fortunately, this is not an audition for a professional choir. But early in our lives, so often, the lines between what is an audition and what is not get blurred. And because we’re young, and the young learn languages quickly and trustingly whether they serve or not, we start saying things like “can’t” and “not good at.” We learn to live our lives by these words. What we can do is be careful with the language of “can’t” and of “not good enough.” We can hear ourselves saying “I’m not an artist,” “I’ve never been good with numbers,” “I can’t cook.” And once we hear it, and hear how much a part of our own realities it is, we can begin to say different things. Because what we say to children, about them, is certainly potent, but not nearly as potent as what they hear us say to ourselves. So much more, they do as we do, not as we say. The good news is that they keep listening, beyond their toddling years, even into their teens, even when they’re rolling their eyes. It’s always worth it to say new things when we realize that old ones are out of synch with what we want to convey, with the kind of experience of being alive and participating that we want to make possible. How do I get my child to __________? In some ways these are all really different questions. The bedroom and violin and the spelling are very different kinds of tasks. But when kids aren’t complying with adult wishes, regardless of the nature of the task at hand, it’s often for very similar reasons. And you can resolve this How do I get my child to… question with one approach for many different kinds of tasks. You can start by checking with yourself about why you think it’s important. Often we decide that kids should be doing various things because we had to, or because other kids are, or otherwise out of habit and popular mandate. Upon closer inspection we may well find that the things we’re insisting upon are not actually in keeping with our goals and intentions for children. We may even be sabotaging our own efforts. Take the pencil-holding as an example. If you’re paying enough attention to how your child is holding her pencil to be upset about it, chances are you are committed to her becoming a proficient writer. Tradition and habit compel us to make children do things whichever way we’ve decided is the best way. We settle on the best way, and then we insist that children adopt that way. Not only is this a sure-fire way to teach young people not to innovate, it doesn’t usually work as a way of getting them to do the thing we’re trying to get them to do and in fact discourages them from getting on board. A good question to ask yourself is Is it getting in the way? Is the way she holds the pencil getting in the way of anything? Is it slowing her down? Is it frustrating her because it’s slowing her down? If it isn’t, then you might want to let it go. There are likely other battles where the thing you’re trying to influence is getting in the way of something, so if this one isn’t, give yourself and your child a break from the battle of it. It’s old news that you can catch more flies with honey than vinegar. There’s a little more to it than that here because it’s not enough to just be nicer with your bossing. If you say “Please hold your pencil like this,” you may feel like you’re being nice, like honey, but it’s the mandate that lands like vinegar. This message curls the tongue and turns the stomach: “I know what’s best and I’m going to tell it to you and you should be grateful that I’m looking out for you.” Kids don’t like being bossed around any more than adults do, and when you stop bossing them around they become available for receiving input, suggestion, recommendation. Several years ago I tried to teach myself to play the guitar. I got good enough that I could strum my way through a few songs, but I couldn’t ever really make sense of the chords, so eventually I stopped playing. I’d learned to read music as a child playing wind instruments, but you can’t play a chord on a wind instrument so that didn’t help much. I understood the idea, but I couldn’t figure out how to include it in my playing. I’ve recently started teaching myself to play the piano, and I’m finding that on the piano, unlike the guitar, I seem to know what to expect from various phrases and combinations of notes. It’s not anything I’m understanding consciously. It’s something about the way my ear and my hands are interacting with the keyboard. 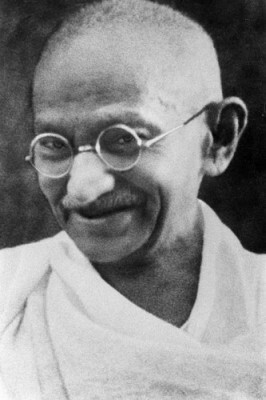 Be the change you wish to see in the world, said Gandhi. I assume he meant that it works better to start with yourself and let that be an example, an inspiration, an opportunity for others to try it for themselves. It doesn’t work as well to start by trying to get other people to take on the change you want. Now that’s an appealing title for a post, isn’t it? But if you decided to read it anyway, you’re probably someone who will tolerate frustration if you believe the payoff will be greater than the cost. I spoke with a mom recently who’s looking for someone to work with her daughter on her piano playing. She’s not just looking for a piano teacher. What she wants is someone with skill in piano playing to accompany her daughter in her exploration of the instrument. She knows her daughter is not likely to become (nor at this point interested in becoming) a professional or otherwise masterful pianist, and so her first priority is that she continues to enjoy and learn. The mom’s experience in piano lessons when she was a child led her to believe that such lessons could put enjoyment and learning in jeopardy. As a culture we have an understanding of what music lessons are. They’re regular, usually weekly; you’re to practice in between lessons; you do it the way the teacher tells you. In other words, we teach piano the way we teach most everything. We don’t often think about whether or not it’s getting us what we want in the way of development in the area, or whether or not it’s a method suited to everyone. We assume, it seems, as though someone already did that thinking and we can trust the process they came up with. Some of the time we probably can, for some of the students. But it’s a really good idea to think about what you actually want from something like piano lessons, and why you’re looking for a teacher, before you go about your search. And here’s where the potential frustration comes in. Like this mom, if you decide what you want – what you think will actually best serve your child – it may well not be the status quo. And if it’s not the status quo, it may be harder to find. You might have to sift through lots of what you don’t want before you find what you do – make lots of phone calls, more than you should have to, read lots of ads, ask lots of people for suggestions. You might have to fail lots of times. But finding the person could be worth the effort. If you set it next to the possibility of settling for someone who isn’t what you want, it might get easier to keep picking up the phone.